Personalized Hair Care. No More Compromises! Does your hair have more problems at one time? Have you colored hair but also dry, oily, fine or damaged? No more compromises. Customize your haircare! The special professional service L'oréal Powermix or Kérastase Fusio-Dose can solve more problems at the same time. Give your hair what it really needs! Is there something your hair mask still missing? Improve it! L'Oréal Professionnel offers a new generation of salon home care - Powermix Shot. Thanks to this, you can treat your hair two different care in one step. And that was previously possible only in the hairdressing salon. Concentrated ingredients penetrate deep inside the hair structure and act from the inside out. Whether your hair is damaged, dry or unruly, the Powermix will solve any problem once and for all! How to improve a hair mask with Powermix Shot? Just one mixing and you’ll have the best tailored hair mask. How to? 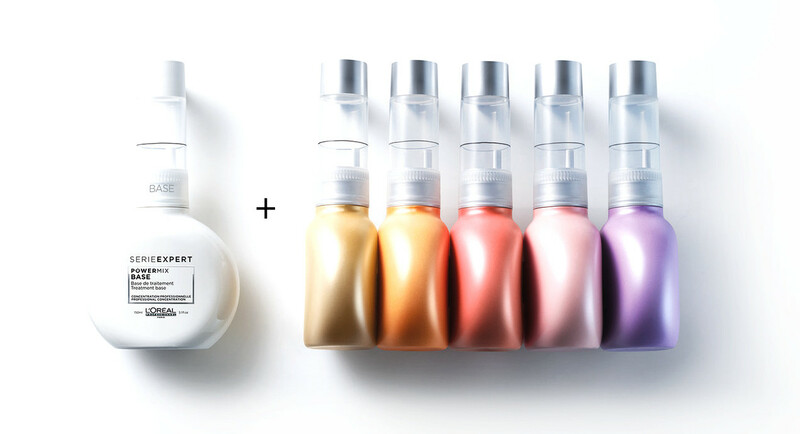 Start with choosing the right Powermix Shot depending on what effect you want to add to your hair mask. Shot Color - an injection of regeneration and radiance of dyed hair. Then mix the contents of the selected Powermix Shot concentrate with the L’Oréal Série Expert mask or another favourite hair mask. Start mixing. Voilà! The most effective personalized hair mask is there. Are you a pro? These additives are intended for you and to your salon: Powermix Liss, Colour, Repair, Force and Nutri. The additives are not mixed with hair mask but with Powermix Base. Kérastase brings the most advanced and luxurious personalized salon care - Fusio-Dose Booster that your hairdresser will mix tailor-made to your hair. This concentrated formula in its purest form immediately transform your hair for lasting results hair within 5 minutes. It leaves the hair stronger, more flexible, radiant and healthier than ever before. But the haircare doesn’t end in the salon! From the luxury of the salon to the comfort of your home Kérastase offers Fusio-Dose HomeLab. Like salon care, it contains carefully chosen fabrics in its most concentrated form. Fusio-Dose's results can now be further prolonged until the next salon visit with 4 personalized at-home applications. How to instant hair transformation with s Kérastase Fusio-Dose? Densité Booster / Homelab - fiber intensely texturized. Fusio-Dose Concentré and Boosters or Homelab merge together and create intense cocktail of active ingredients for a real transformation of the hair fiber. This system offers you up to 20 combinations for the most personalized treatment. Just like in Kérastas salon. You will never need to make any compromises!